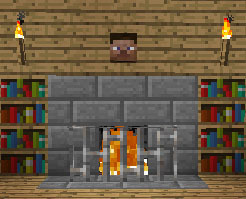 Player Heads Mod for Minecraft. Heads are in vanilla Minecraft, but do not drop and cannot be created without mods or external programs. All this mod does is add the ability for players to drop heads. A player’s dropped head will of course be called “<username>’s Head” and use that player’s skin. Drop rate is configurable and there is an option to allow head drops on any death or only when a player is killed by another player (technically, if a player was damaged by a player within three seconds of death). Defaults to only drop if the player is killed by another player, with a 10% chance. The drop rate and conditions can be customized in a nice little properties file! The properties file is generated in your .minecraft/config directory.